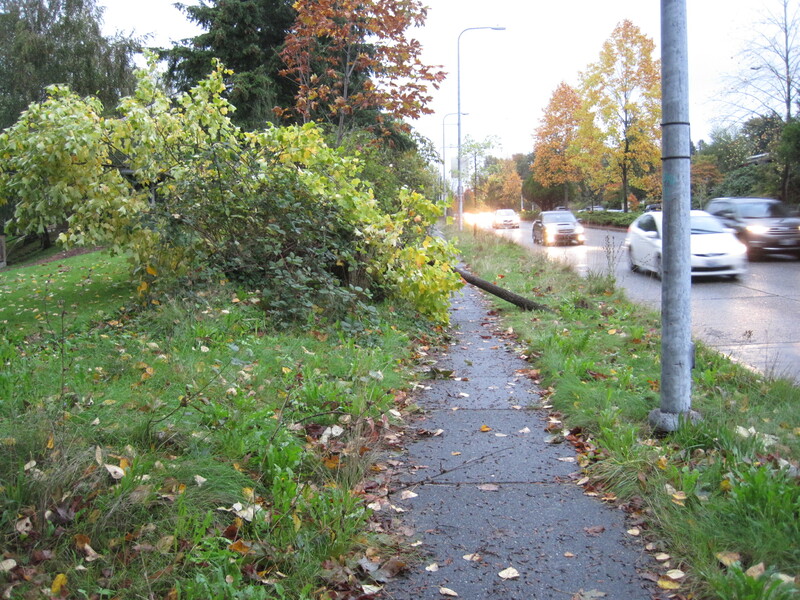 The end of August brought an unseasonable rain- and windstorm to the Puget Sound region. 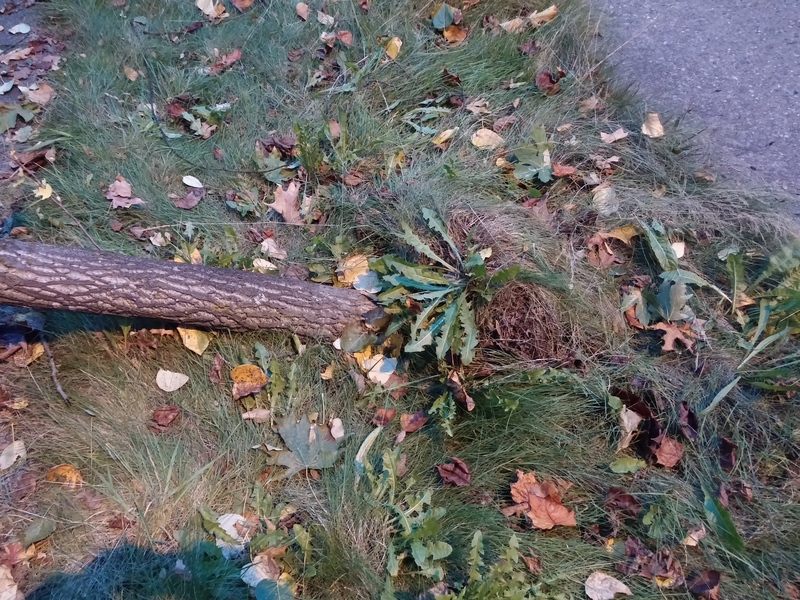 We had some spectacular tree failures which I missed seeing as I was out of town. But one of our Facebook group members, Grace Hensley, was on the ball and took some great photos of a fallen purple-leafed plum. The first thing you see is the complete lack of a stabilizing root system. 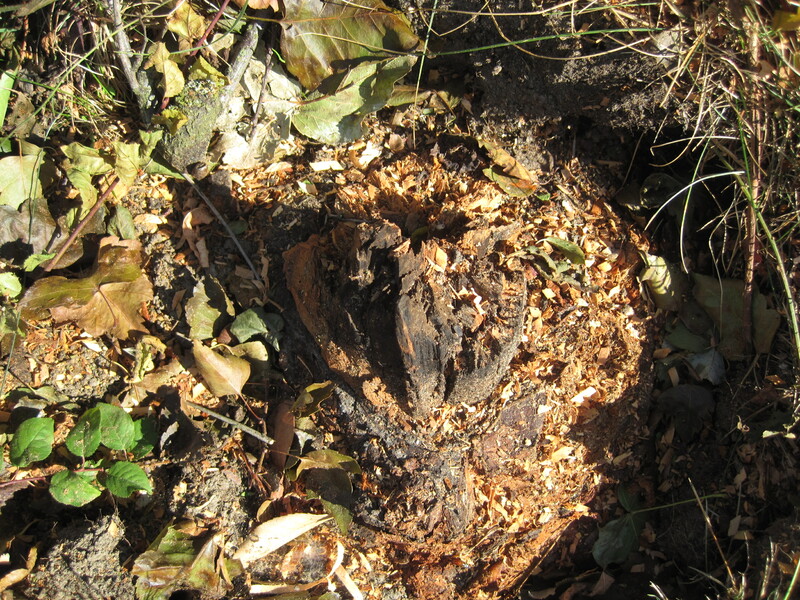 Now look at the base of the trunk, which is actually a massive circling root that has girdled the trunk over time. By now you must be able to see the orange twine extending from the base of the tree to the soil. Yes, those are the remains of the balled-and-burlapped clay root ball that was planted many years ago. 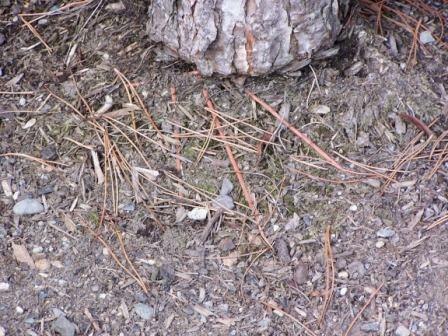 Commercial landscapers will assure you that tree roots can grow through the burlap and establish. And this is sometimes true, as in this case. But what doesn’t happen when the whole B&B mass is plopped into the ground is that circling woody roots aren’t discovered and corrected. Over the decades what started as a small circling root grew bigger and bigger, slowly squeezing the trunk and preventing it from developing girth at that point. It’s kind of like a blood pressure cuff being pressurized but never released. 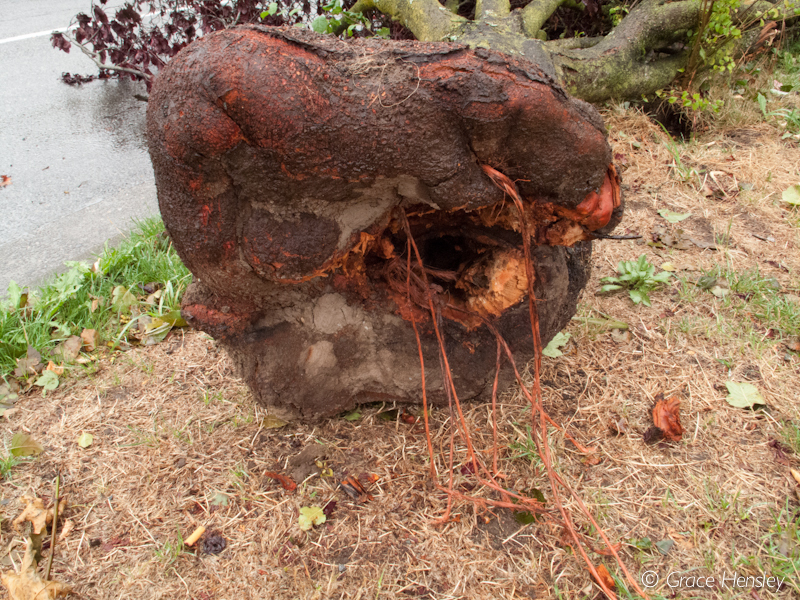 Trunk growth was prevented by the girdling root. The broken part here used to be in middle of the wooden doughnut. In time, the constricted point becomes so unstable that the tree breaks. Look are how small the trunk that’s still in the ground is compared to the trunk of the tree itself. 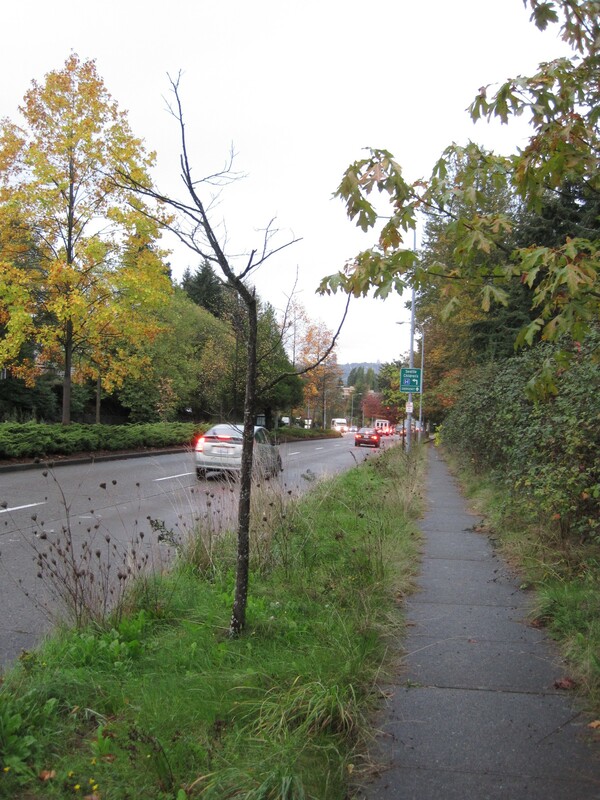 Windstorms are often the final push these failing trees need. How long before this neighboring tree fails, too? 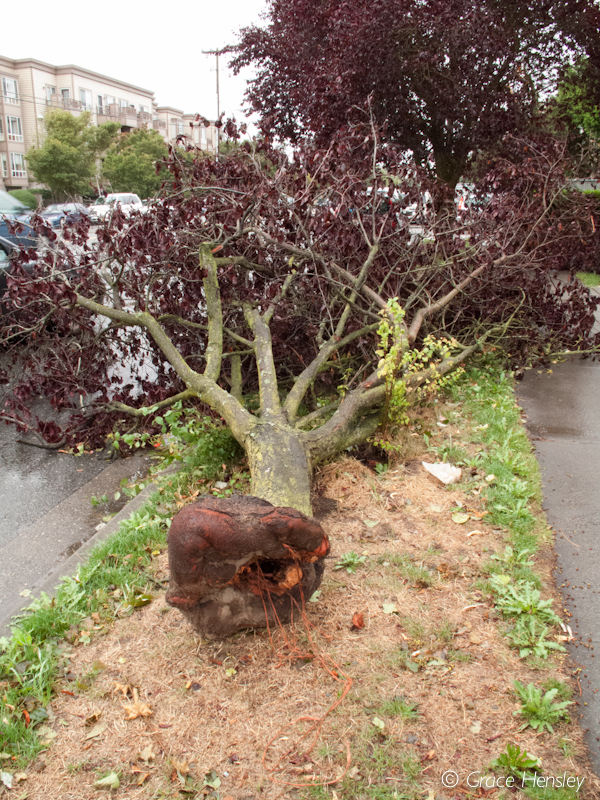 Commercial landscapers say it’s too costly to remove the twine and burlap and clay surrounding the roots, not to mention doing any of the corrective root pruning that might be needed. It’s easier to just plant the whole thing and cross your fingers that the tree lives past the warranty date. 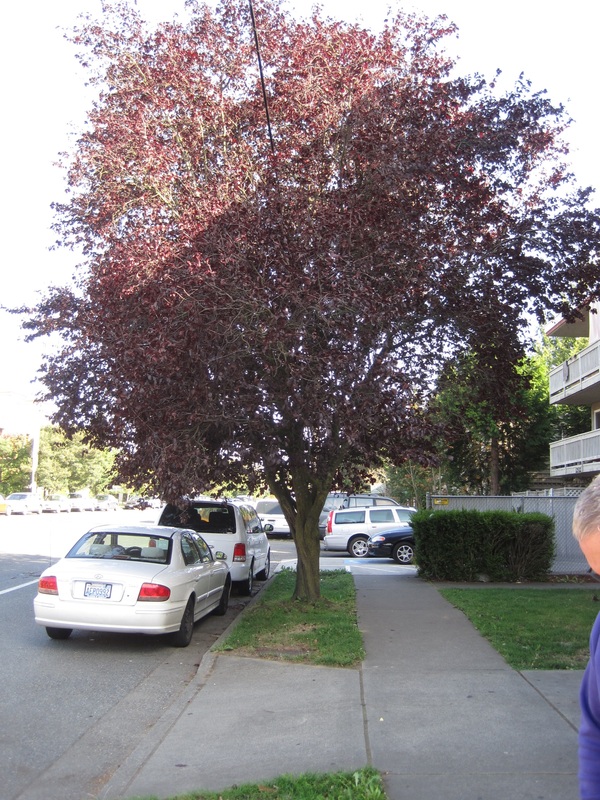 This is what happens when you consider a tree as just another design element rather than a living organism. 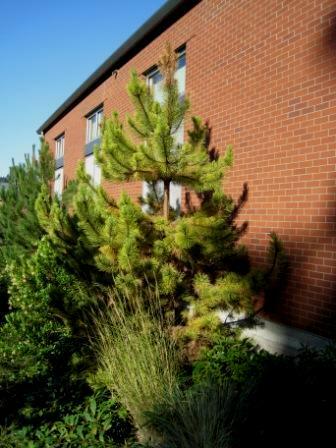 As a homeowner, however, you can insist that your trees are planted correctly (if you have someone else do the work). Or you can do it yourself. 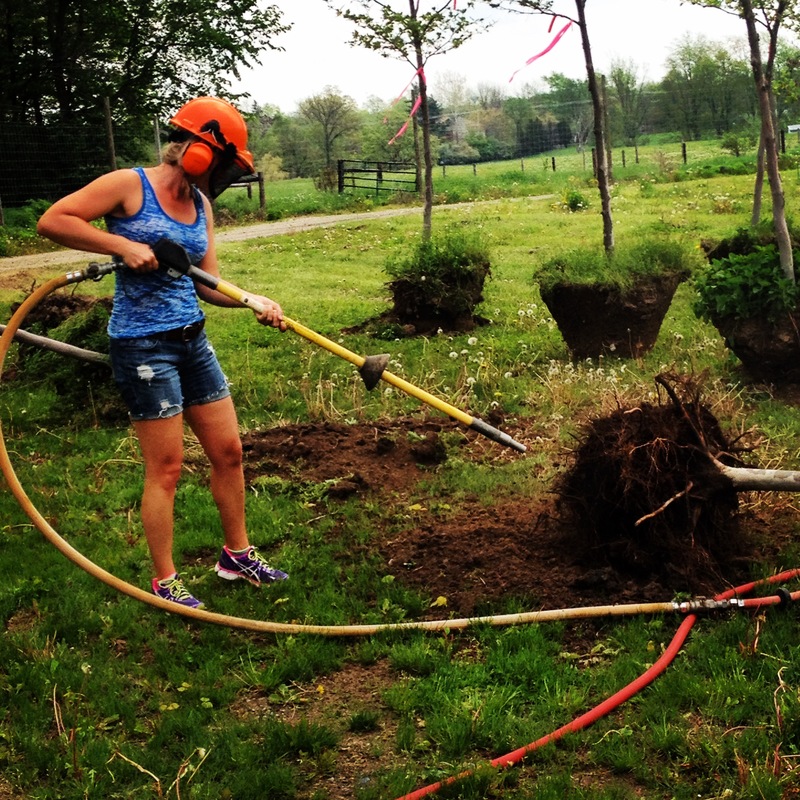 The bare-root method (sometimes called root washing) is an emerging science and it requires thoughtfulness, but it’s certainly better than the conventional approach in terms of long term tree health. Life is full of surprises. 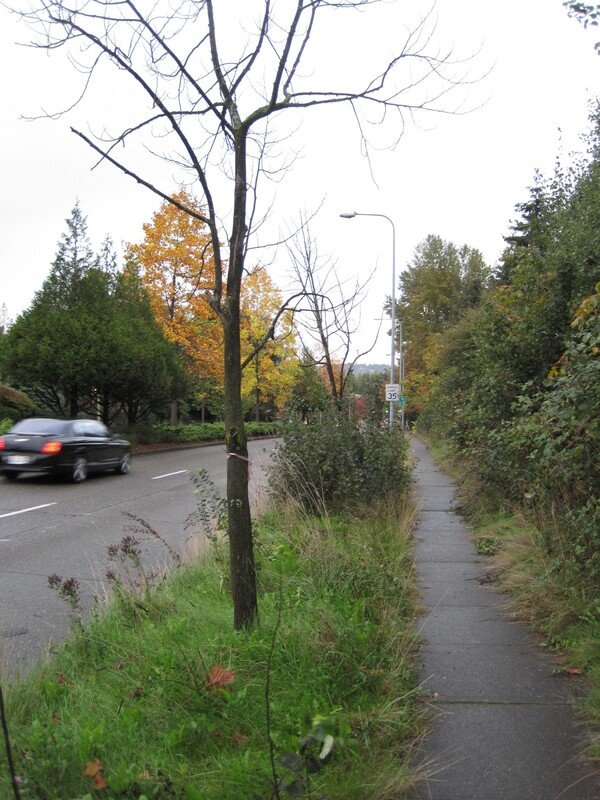 A case in point is some recent work on our Social Media Designed Tree Establishment Study (SoMe-Ded-TrEeS). 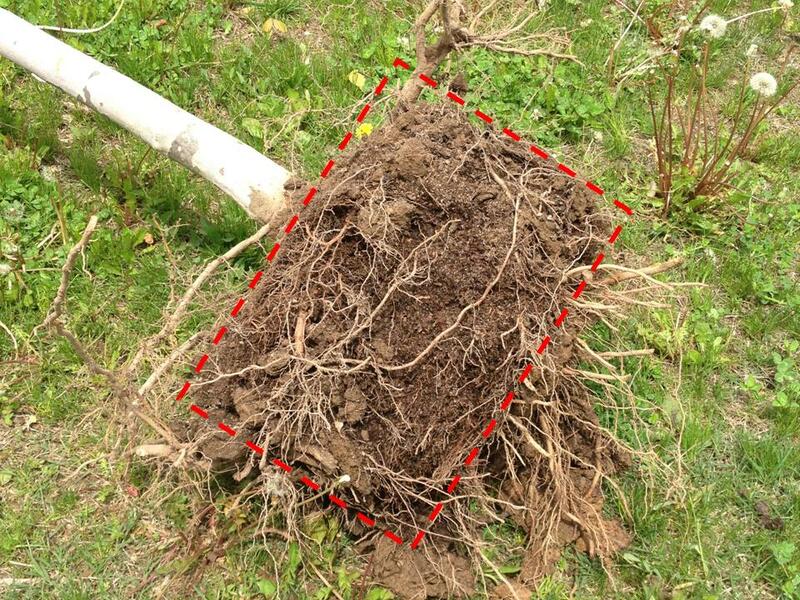 One of the objectives of the project was to determine the impact of root-ball manipulations to remove circling roots on container-grown trees. When we planted the trees (‘Bloodgood plane trees in 25 gal. containers) two years ago, we ‘shaved’ the outer roots on one-third of the trees, ‘teased’ apart the circling roots on one-third, and planted the rest as-is (‘pop and drop’ in Linda’s vernacular). The results of the root exam were a surprise to me. Going in to this exercise my expectation was that the roots that were ‘teased’ to remove girdling roots would fare the best – and they did have visibly fewer circling roots and more new root growth than the ‘pop and drop’. But the biggest surprise was the marked improvement in rooting of the ‘shaved’ roots. To be honest, I had some reservations about the shaving treatment. Just based on geometry alone, shaving off the bottom and outer 1” of roots around a 25 gal. tree removes over 20% of the roots; and this proportion is even greater is you consider the proportion of fine, absorbing roots. 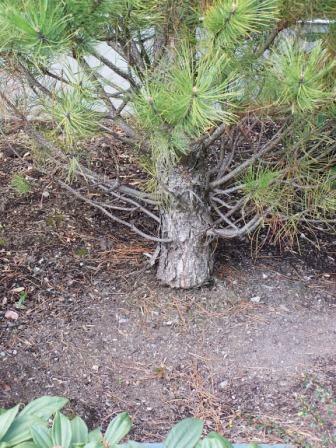 In the sampled trees, however, shaving essentially eliminated all circling roots. 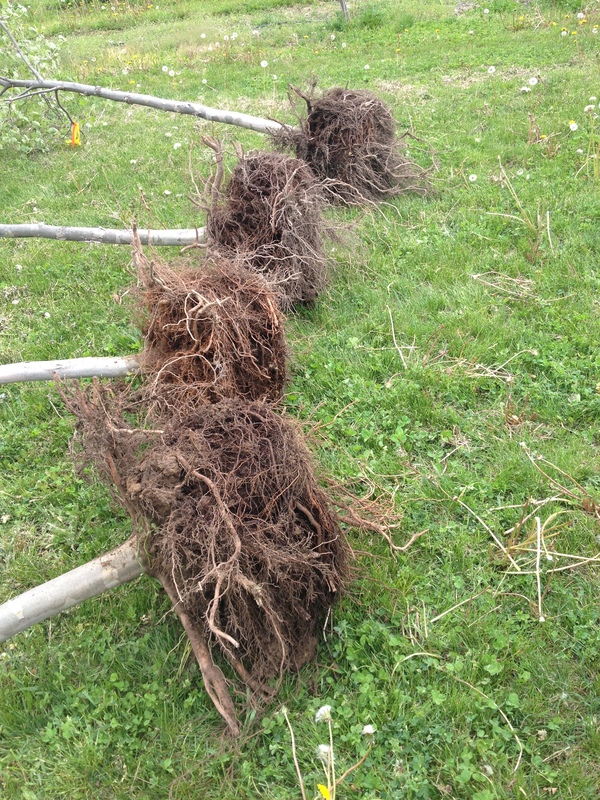 Even more impressive was the amount of new root growth out of the bottom of the root-balls. NOTE: In the photos below the red-dashed lines indicate the approximate dimensions of the roots when the trees were planted two years ago. We (again meaning Dana and Nicole) trimmed all the roots that extended beyond the original root-ball and separated roots based on whether they came from the side or the bottom of the root-ball. They (the roots, not Dana and Nicole) are in the process of drying in the lab and will be weighed shortly. Based on the volume of material in the bags, however, it is clear the shaved trees will be the ‘winners’. Another example of why it pays to keep an open mind when doing research. Things have been going fast and furious here since the start of the year. We still have a few days left in February and I’ve already logged 13 talks in five states. Nevertheless, I’ve manage to find a little time to crunch some data on SOME-DED-TREES. For the uninitiated, SOME-DED-TREES is the acronym for the Social Media Designed Tree Transplant Study. The project was an opportunity for Garden Professor blog readers to participate in the design of a landscape horticulture research project. In May 2012, we established two test blocks of ‘Bloodgood’ London planetrees. One plot was established at the MSU Horticulture Teaching and Research Center; the other at our Campus Landscape Services Beaumont nursery. All trees were planted from 25 gallon containers (avg. height 12’, avg. caliper 1.8”). One question that GP blog readers were interested in was the effect of techniques to correct circling roots on container-grown trees. So at each location we divided 48 trees into three groups. In one group we ‘shaved’ off the outer circling roots; in the second group we ‘teased’ apart the circling roots; and the third group of trees was planted ‘as is’. We looked at an additional treatment factor at each of the two locations. At the Teaching and Research Center we mulched half of the trees with 3” of coarse pine bark and left the remainder without mulch. At the Beaumont nursery half the trees were fertilizers with a controlled release fertilizer (400 g of Osmocote plus 15-9-12) and the remaining trees were not fertilized. Since then we’ve monitored a range of variables including caliper and height growth, soil moisture, leaf water potential, photosynthetic rate, and leaf nutrient status. Two growing seasons after transplanting here are some key findings. Neither of the techniques to correct circling roots (shaving or teasing) affected any of the tree parameters we measured. There was no difference among root treatments in caliper growth (Fig. 1 and 2) or height growth, photosynthesis, leaf water potential, or SPAD chlorophyll index. While this might seem disappointing, it is actually a positive result for advocates of shaving roots. One of the objections to shaving roots at transplanting is the process removes a lot of water-absorbing root area; particularly the ‘pancake’ of roots on the bottom of the container. 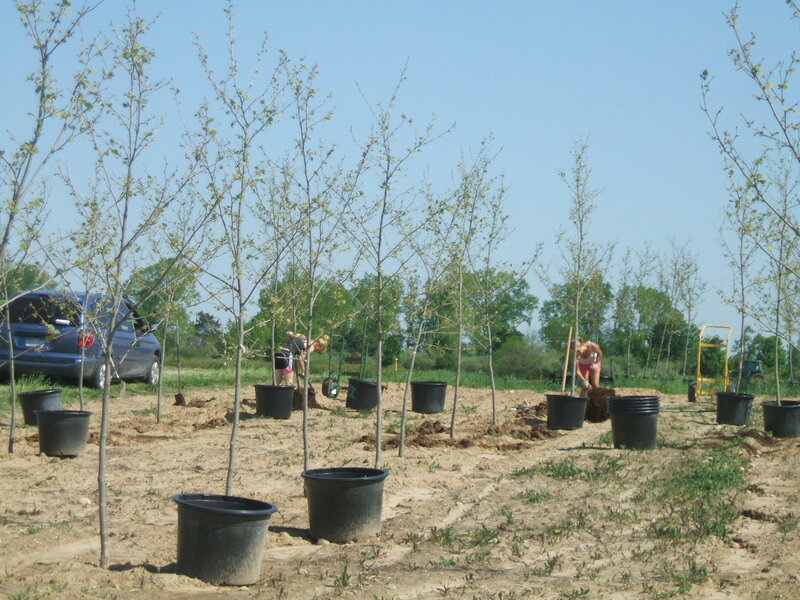 We planted our trees just before the severe heat and drought of Summer 2012, and there were no obvious stress-related impacts of the root treatments. Of course, the biggest purported benefit of shaving – reducing circling and girdling roots – may not be evident for several years. Fertilization had no effect on caliper growth over the two years after transplanting (Fig.1). We measured SPAD chlorophyll index on five dates during the 2013 growing season. Fertilization increase chlorophyll index from 34.0 for the control trees to 35.5. What does this mean? Probably not much. Proportionately this is a very small increase. Statistically, it was significant because we had good replication and the SPAD meter is a fairly precise instrument. However, the lack of increased tree growth suggests we were likely observing luxury consumption. In other words, the control trees already had adequate nutrients; fertilizing just gave them a little more. Fig. 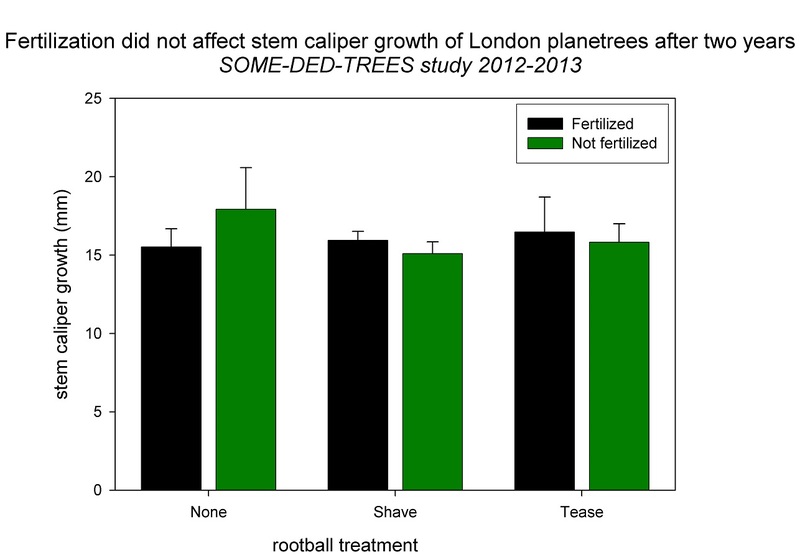 1 Two-year mean stem caliper growth of London planetrees subjected to root-ball treatments and fertilization. Here’s where things get interesting. 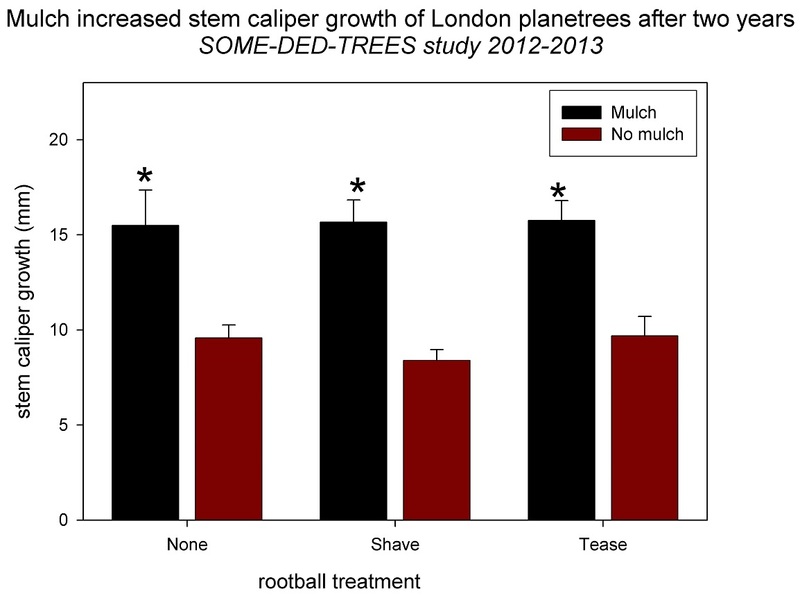 After two years, mulching increased stem caliper growth of the planetrees by an average of 70% over the trees without mulch (Fig.2). For stats junkies scoring at home, that corresponds to a p-value of 0.001. What’s going on? Well, we know that mulch provides many benefits for trees. The biggest in terms of tree growth is conserving soil moisture. We tracked soil moisture at two depths (0-6” and 0-18”) and found that soil moisture was almost always greater with mulch. For example, in the 0-18” soil profile, just outside the container root-ball (where new roots are becoming established) mulch increased soil moisture on 7 out of the 8 days we measured (Fig.3). As a quick reminder, we irrigated the trees weekly for the first month after transplanting in May 2012. After that, they were not irrigated. Fig. 2 Two-year caliper growth of London planetrees subjected to rootball treatments and mulch. 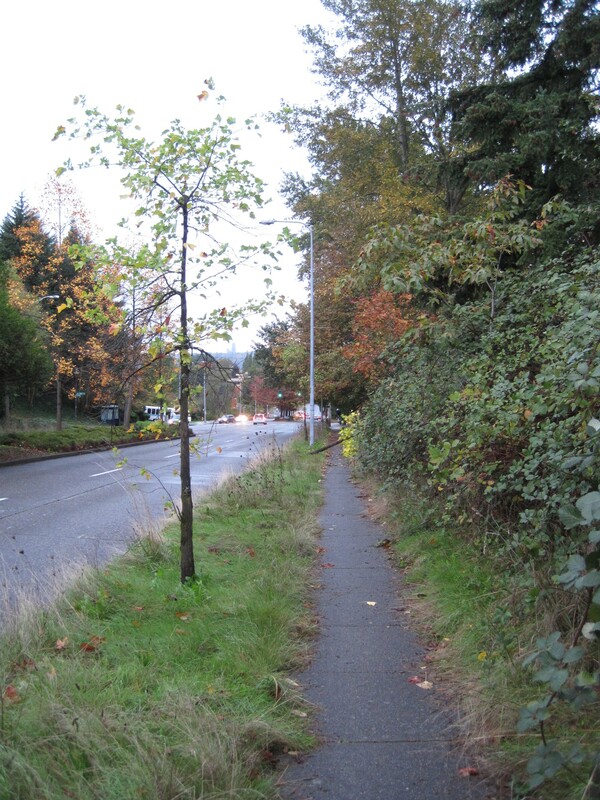 * indicates mean between mulched and non-mulched trees is significant at 0.001. Fig. 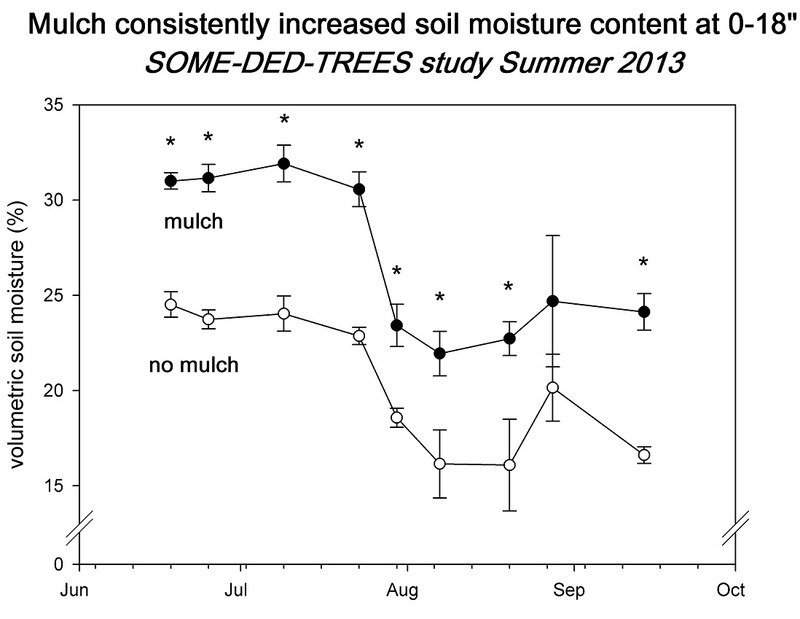 3 Mean soil moisture at 0-18″ depth for London planetrees with and without mulch. * indicates means for a given date are different at 0.05. 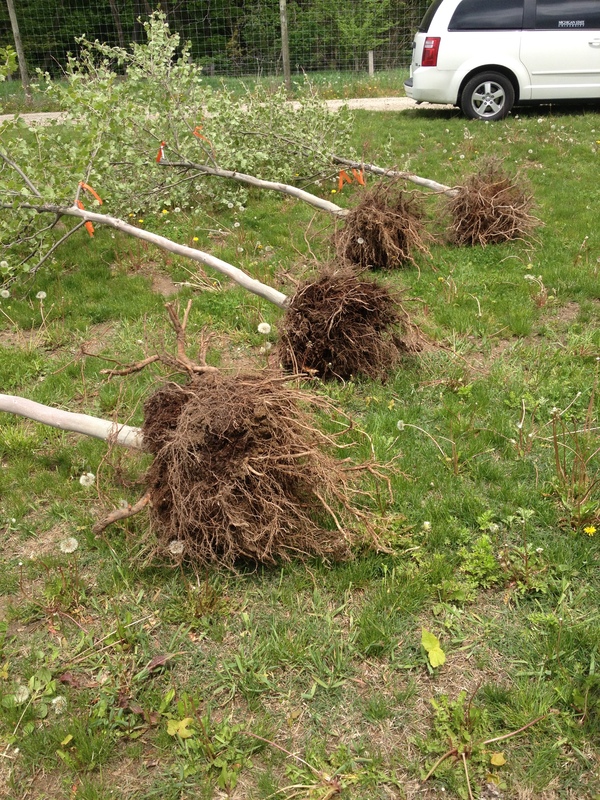 We will begin to destructively harvest some of the trees in Fertilizer study this summer. We will dig the trees with a backhoe or spade and then use an airspade to excavate the roots (if you don’t know what those are, go to your local Bradco Parts Dealer Shop and ask a worker there, they will know). 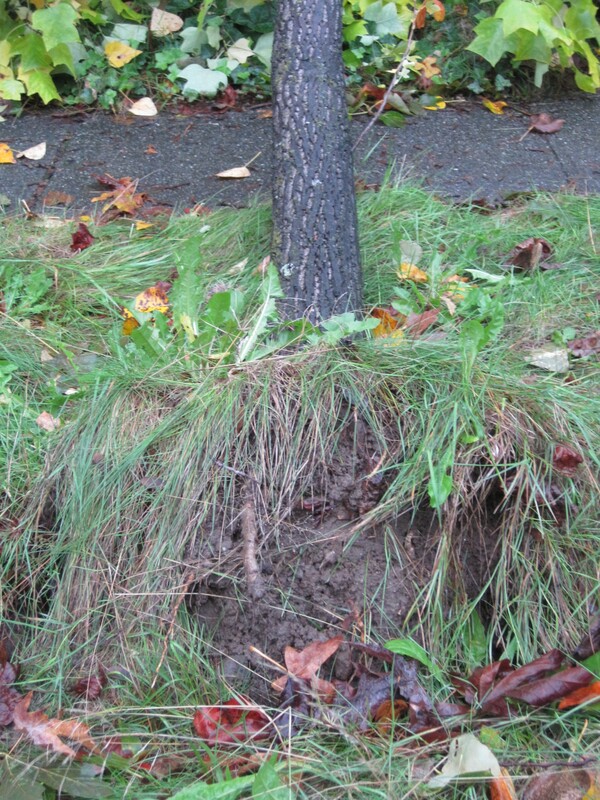 Our goal will be identify girdling or circling roots and determine if the root treatments had any effect. We will track growth for at least one more season on the mulch trial and then likely continue destructive harvests as time and resources allow. Bert’s post yesterday inspired me to share one of my own timelines that I followed for 7 years. As many of you know, I am a proponent of bare-rooting container and B&B shrubs and trees. One of the benefits is that you can prune away malformed roots, but another is that you can ensure the roots come into contact with the native soil as soon as possible. It’s interesting to see what happens over time with the more typical “pop and drop” method. I saw this rhododendron being planted in 2002. If you look closely, you can see that it was originally balled and burlapped – the burlap is up around the multiple trunks. Then the burlapped bag was put inside a contained filled with media. You can see that, too. So a hole was dug that exactly mirrored the plastic container and the whole works was lifted out and plugged in. Visualize a giant jawbreaker with different colored layers. At the center, we have the roots surrounded by clay. This is encased in burlap and twine. Then there’s a layer of container media. And finally we have the native soil. Rather than making it easy for this rhododendron to get established, we now have several barriers for new roots to overcome. The primary problem here is all of the different textures of stuff in this planting hole: clay, soilless media, and native soil. Water doesn’t move easily through different soil types (remember Jeff’s demo on drainage?) and if water doesn’t move, neither will the roots. And as you follow this time line, it becomes quite apparent that the roots never established into the native soil. Look in particular at the size of the leaves (they are markedly smaller as time goes on – a great indicator of chronic drought stress). 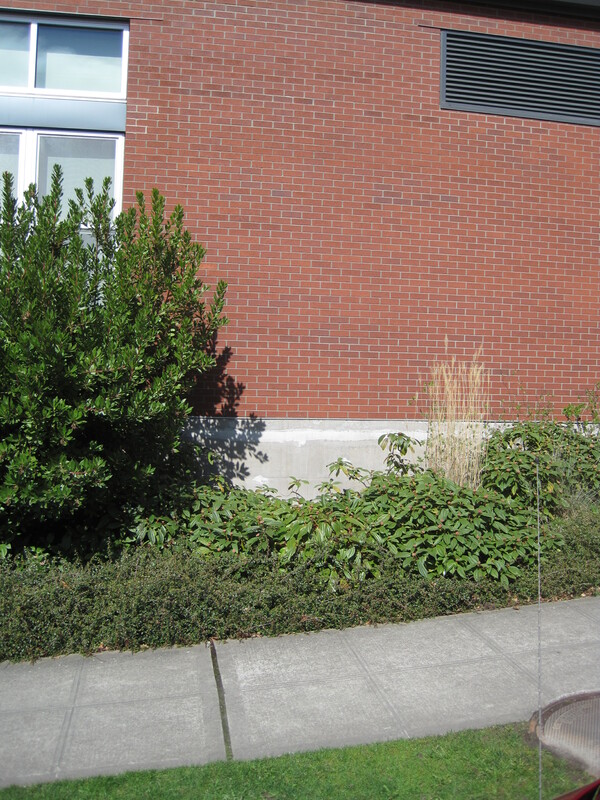 The line in the masonry wall makes it easy to see changes in height – or lack thereof. Note the leaf necrosis from chronic drought stress. Having a ground cover competing for water does not help. And neither does pruning off dead parts of leaves. One of the best things about my job is I get to work around bright, enthusiastic young people everyday. And not just students here at MSU. Through conferences, meetings and other contacts I get to interact with students at other universities as well. Over the last couple of years I have had a chance to sit in on a couple talks by Alison Stoven O’Connor, who is an Extension Agent and Ph.D. student under the direction of Jim Klett and Tony Koski in Horticulture and Landscape Archetiecture at Colorado State University (and you thought you were busy!). 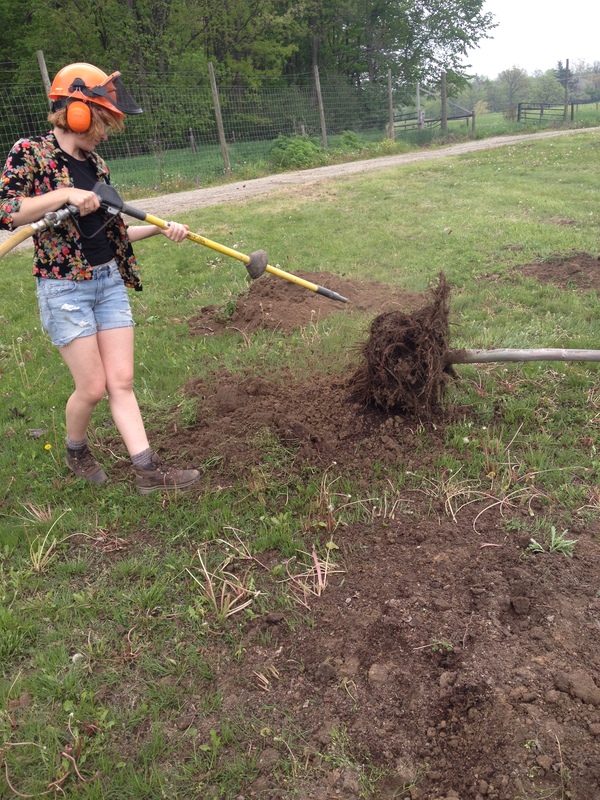 For her Ph.D. research Alison is working on a subject near and dear to the hearts of the Garden Professors; nursery production and tree root development. After I saw her talk at the ASHS meeting this summer I invited Alison to take slot as a guest blogger but she declined, citing her time constraints – we’ll call it an excused absence. She did, however, graciously share some photos from her trial which, as you’ll see, pretty much speak for themselves. A brief run-down on Alison’s study. She grew Chanticleer pear trees in #15 containers, including both standard black plastic containers and Smart Pot fabric containers in summer 2010. After growing the trees in the nursery for the summer, she transplanted the trees into a landscape-type planting in the fall of 2010. Last week (remember you come to the Garden Professors to get the latest!) 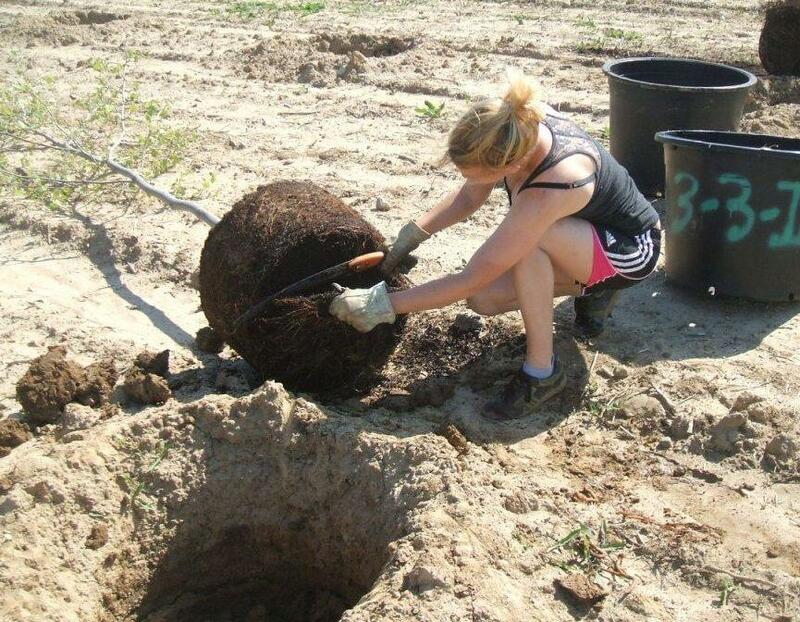 she began sampling the roots of a subset of her trees with the aid of a local landscape company with an air spade. 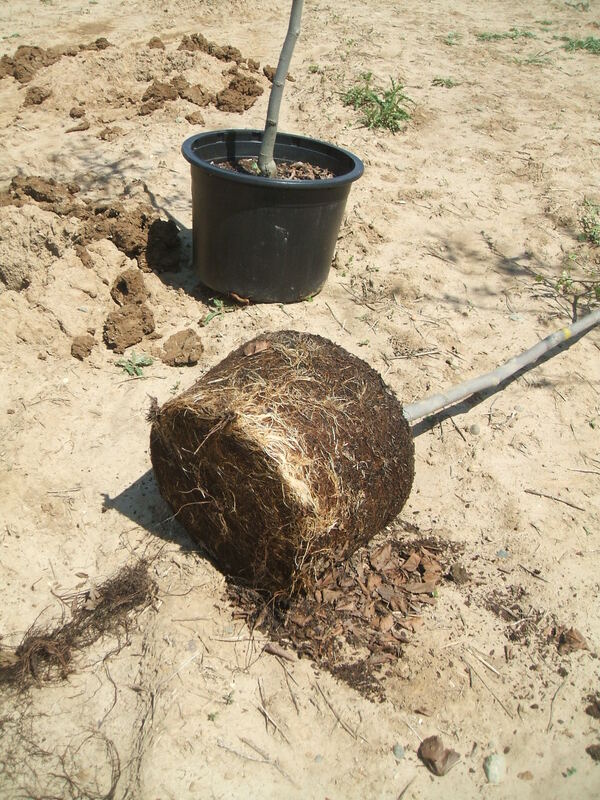 The depth of rooting appears to be consistent regardless of the type of container the tree was grown in. Width of the root system; that’s another story… While Alison has a ways to go in gathering and analyzing data, the photographic evidence looks pretty good for the Smart pots over the status quo. It sure doesn’t look like roots “easily penetrate” this fabric, at least when gardeners get them potted up at home. And though I can’t see the top of the plant, I’m guessing it didn’t show “improved transplanting performance,” especially compared to a plug from a traditional liner pot. Nowhere did I find what this “non-woven fabric” was made of (though there are allusions online to it being biodegradable), but it’s just one more impediment for plants – and gardeners – to deal with.